Lately, I find myself skipping happily down the scrap trail. It all started a few months ago when attempting to control the chaos in my studio. I came to the conclusion that I need to "use up" a lot of my supplies. (Notice I didn't say "get rid of" or "give away.") It was also about this time that a number of blog artists were taking this online class and posting amazing photos of the results. This looked like the perfect way to pare down some of the stash. I didn't sign up for the online class though because my poor, aging computer has a problem with videos. Still, I was eager to give it a go and decided I would just dive right in. I dusted off my sewing machine, pulled out a drawer full of scraps, and got to work. After a fair amount of trial and error, I found a method that works for me. I currently have a couple of unfinished journals because I haven't quite figured out how to bind them. I guess that's where the class would have been really helpful. It occurred to me one day that the journal pages I was making would also make interesting post cards. So, when I made the travel fund savings bank that I posted about here I also made a bunch of post cards to go with it. I got a little scrap happy and made about a dozen cards. The central image on each one was cut out of a travel brochure and sewn together with miscellaneous paper scraps from my stash. Some of my favorite papers to use are maps and recycled wrapping paper. I kept the cards a bit simpler than the journal pages because I knew the recipient would be more interested in the travel image than the rest of the collage. The back side of each card is collaged as well, including some plain paper for addressing. I hope you enjoyed this little jaunt to far-off lands. 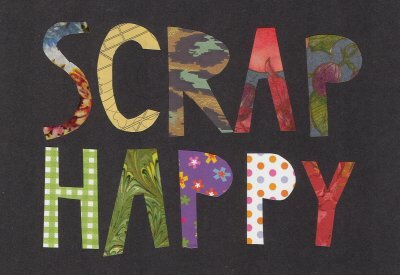 Happy trails and happy scrapping! Shades of long-lost mail art. I love them!